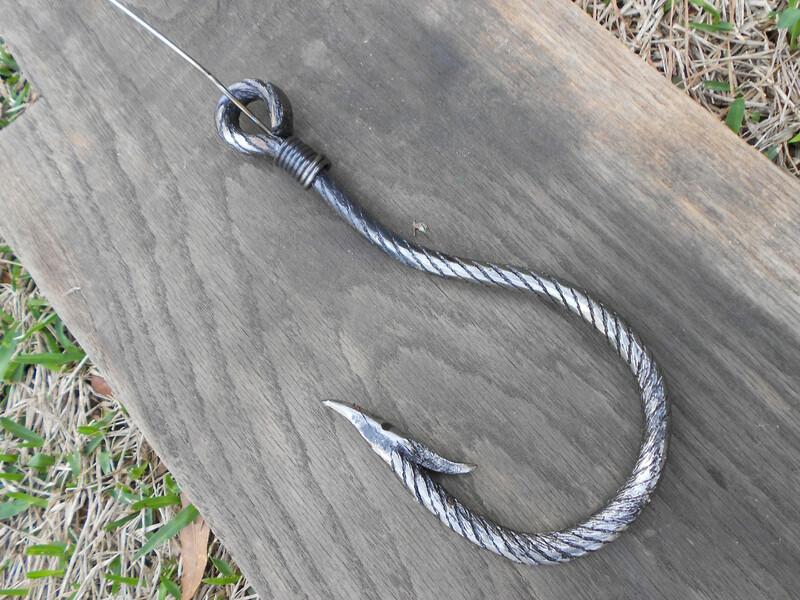 Cable Damascus Fish Hook - The Iron Forge Fire Blackmithing Forum. 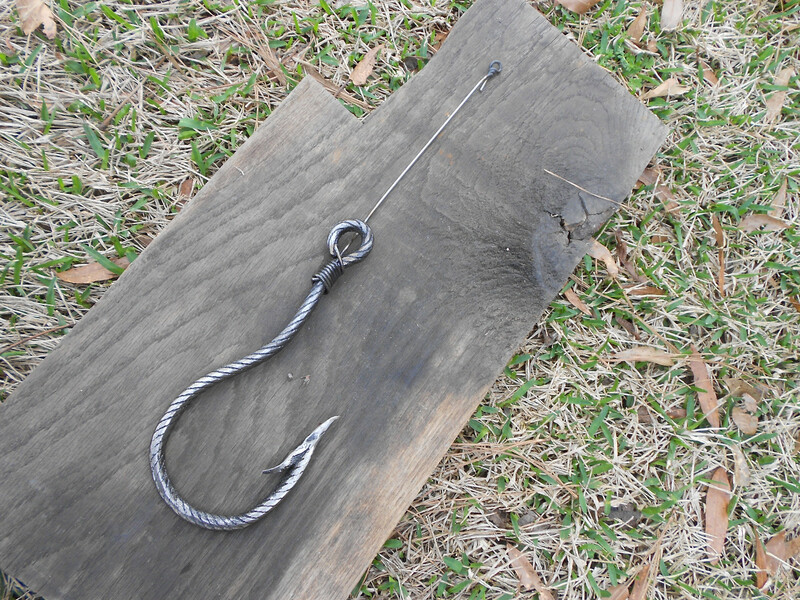 I got a wild hair and decided to forge up a fish hook from crane cable. It started with a piece of 1/2" crane cable. The ends were welded then at welding temps the cable was twisted. It was further forged down into a round bar. The eye was forged in first. The barb was forged in on the other end then hot cut and folded back. That was forge welded and shaped into the point. It was cleaned up with a flap disk and a leader was made with stainless tig rod. What are you fishing for?? Great Whites? What's that quote from Jaws?, "I think we need a bigger boat." Interesting, that would make a Great Wall Art piece for back in New England, and if you ever Fished for Blue Fin Tuna, 1200 to 1500 lbs., a big hook would come in handy, sometimes too. When you heat the cable to welding temp... you said you twist it, is that when it welds itself together ? Will it stay together or do you need to hammer some, per your picture ? Also, the temperature to forge weld cable must be at a lower temp than pieces of steel plate or is there one temp for forge welding ? I'll link to a video of me doing a snake from cable. It's the same process. Welding temperatures are the same for cable as flat sheets. Welding temps are related to carbon content, the more carbon the lower the temperature needed. With cable however you have thin wires that can burn before the rest reaches welding temps, this is really a problem if coal is used. What Seafood restaurant or avid angler wouldn't want that work of art hanging on the wall. Of course you could go fishing for megaldon! Sorry Jim but just got back to this Video you posted, six month... where does the time go ! What you do and how you do it always makes it look easy but I'm guessing it isn't as easy as you make it look. This Video gives me an idea of what to do to use Cable for all projects, I didn't think I would want to Forge Weld but you make it loo like something I want to try.